In demand: Yoann Huget breaks against Italy – but will he be wearing Toulouse colours this weekend? 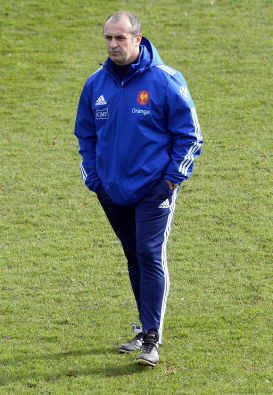 ONE WOULD have thought there would be a smile on the face of French rugby this week. Two wins out of two in the Six Nations, already one more than they managed last season. In fact, less than six weeks into 2014 and Les Bleus have already equalled their win tally for the previous calendar year. But the atmosphere within French rugby is fractious when it should be felicitous. For despite the fact the French are level on points with Ireland at the top of the Six Nations table, the clubs aren’t happy – and as they wield most of the power in France, they’re threatening to flex their muscles. The reason for their chagrin is simple. This weekend sees a full programme of Top 14 fixtures with leaders Clermont facing a tricky trip to Grenoble and second-placed Stade Francais venturing into the back of beyond to play Brive. Toulouse, meanwhile, who lost at home to Montpellier on Saturday and dropped out of the top six as a result, are in Biarritz while reigning champs Castres take on Toulon. Big fixtures, and the clubs want their big players. But France coach Philippe Saint-André, in accordance with the agreement signed between the LNR and the FFR in December, submitted on Monday a request that 12 players be rested this weekend. The drained dozen are those players who started both the England and Italy matches: Yannick Nyanga, Louis Picamoles, Yoann Huget and Jean-Marc Doussain (all Toulouse), Thomas Domingo and Wesley Fofana (Clermont), Nicolas Mas of Montpellier, Toulon’s Mathieu Bastareaud, Bernard Le Roux of Racing, Castres’ Brice Dulin and the Stade Francais pair of Pascal Papé and Jules Plisson. In all probability PSA had his coffee and croissants on Monday morning while reading the latest edition of Midi Olympique. The reports and analysis of Sunday’s victory over Italy would have gladdened his heart (Rabah Slimani’s red card and creaking scrum apart), but PSA must have shuddered when he turned to page four. Under the heading ‘La grogne de clubs’ (the rumbling discontent of the clubs), Toulouse, Clermont and Stade Francais all made clear their opposition to the idea of resting players this weekend. On Monday evening L’Equipe reported that despite phone calls from Saint-André and FFR president Pierre Camou, Bouscatel was refusing to stand down Nyanga, Picamoles, and Huget from club duty this weekend. The words of Stade Francais coach Gonzalo Quesada were more temperate, the former Argentina fly-half saying he wanted all his players back for the trip to Brive because “one has to understand that we also have our objectives”. As for Clermont, vice-president Jean-Marc Lhermet said they intended to play Domingo against Grenoble, warning the FFR that they risk “initiating tensions between the clubs and the France coaching staff because I believe that, on this subject, the clubs stand together”.